This article explains the relationship between infection and eczema. Causes of infection and details of treatment are fully covered. Skin affected by eczema tends to develop small cracks and fissures on the surface. This provides entry points for bacteria, which cause infection. Infection makes eczema worse and treatment more difficult. The skin can become more cracked which leads the way to further infection. Breaking this cycle of infection is the key to successful treatment. Both contact and atopic eczema may become infected in this way. The commonest cause of infection in eczema is a bacterium known as Staphylococcus aureus. It thrives on the weepy, broken skin of eczema. When infected, there may be over 100 million bacteria on a patch of eczema just the size of a finger nail. It is now known that Staphylococcus aureus is found on the skin of virtually everyone with atopic eczema, even when there are no obvious signs of infection or eczema, whereas it occurs on the skin of less than 1% of people who do not have eczema. Recent studies have shown that Staphylococcus aureus can trigger off eczema in areas of the body away from the bacteria. For example if the bacteria are found on the forearm, it can cause a flare up of eczema in the crease of the elbow joint. There is growing scientific evidence that infection with Staphylococcus aureus makes atopic eczema worse and hinders healing. The number of bacteria on the skin has been found to multiply with the increasing severity of the eczema. Staphylococcus aureus has been shown to produce toxins which trigger an exaggerated reaction from the body’s defence system. It is thought that this over-reaction itself causes part of the problem. This process is rather like a large, over-enthusiastic army fighting against a few invaders, and trampling the ground to pieces in the process! Are there any other causes of infection in eczema? Streptococci are another group of bacteria, related to the Staphylococci family, which may lead to infection in eczema. Candida or ‘thrush’ is a yeast infection which may develop on skin with eczema. Warm, moist folds of skin such as in the groins, under the breasts or around the nappy area in babies are the areas most likely to become infected with Candida. Skin infected with Candida looks red and feels itchy and sore. There may be tiny yellow pustules. This can often be treated with an anti-fungal/steroid combination cream. Ringworm is a fungal infection particularly common between the toes (athlete’s foot). It can often look like eczema. In people with eczema an anti-fungal/steroid combination can be used. Chicken pox is caused by the Varicell zoster virus. If a child with eczema develops chickenpox, emollient therapy should be continued and aqueous calamine cream can be used to help relieve itching. Wet wrapping the topical steroids should not be used while the chickenpox is active, but may be continued when the scabs have dried out. In some children, the eczema subsides while the chickenpox is active. The cold sore virus Herpes simplex can cause severe infection in anyone with eczema, because they have a lowered resistance to the virus. Therefore, it is advisable to avoid contact between anyone with eczema and a person who has the cold sore virus. This might even mean that a mother should not kiss her baby, if she has Herpes simplex and the baby has eczema. A condition known as ‘eczema herpecticum’ may develop if eczema becomes infected with Herpes simplex. The symptoms are flu-like and the skin feels sore and tender rather than itchy and there may be small blisters present on the face, hands and fingers. The majority of cases are mild but if you suspect eczema herpeticum you should always seek medical attention. Eczema herpeticum may require treatment with an antiviral drug. becomes very infected, there may be a general feeling of illness, together with a raised temperature. How can I tell if eczema is infected? If repeated attacks of infected eczema are suffered, your doctor may take a swab from the skin to be sent to the microbiology laboratory. This is a quick, painless procedure, and can help confirm what organism is causing the infection. It can also show which antibiotics should be effective as treatment. The possibility of infection should always be considered in eczema which is getting worse or not responding to emollient or steroid treatment. Because Staph. Aureus is found on the skin of almost everyone who suffers from atopic eczema, it is difficult to prevent infection. However, by treating the infection with the most appropriate medication, both the bacteria and eczema can be kept under control. Restoring the skin’s barrier to infection, by reducing dryness and cracking, will help to reduce the entry points for bacteria. Intensive emollient therapy will improve the barrier function of the skin. Other simple prevention measures include a daily bath or shower using a soap substitute and good hygiene when applying creams (a pump dispenser or spoon is more hygienic then dipping your fingers into a pot of emollient). If infections keep occurring, other members of the family may need to have swab tests, to see if they are carrying any skin bacteria. What treatment is available for infected eczema? 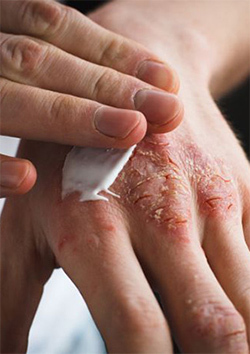 Bacterial infection of eczema should be treated with antiseptics or antibiotics. These can be applied topically as a cream, ointment or lotion. Studies have shown that topical antibiotics are successful in cases where pustules are present under the skin or when the skin is cracked, broken or weeping, giving easy access for bacterial infection. Combination creams, which contain both a steroid to help combat inflammation and an antibiotic to fight the infection may be prescribed by the doctor. Antibiotics can also be taken by mouth, usually several times a day for one or two weeks. Where thrush or ringworm is suspected a steroid/antifungal preparation may be used. In the moist skin folds, a cream containing steroid, antifungal and antibacterial properties is sometimes needed. Sometimes an antiseptic bath additive may be recommended by your doctor to help fight infection. However, strong antiseptics should not be used because they can cause irritation. When infection is being treated, it is important to continue with emollient therapy to help feed moisture back into the skin. If the eczema is getting worse, is not responding to treatment or looks infected you should return to see your doctor. If flu-like symptoms develop with a raised temperature and the eczema worsens, then seek medical advice. Wet wrapping should not be used on infected eczema as the moist conditions provide an ideal breeding ground for further bacterial growth. If you are using the wet wrapping technique and suspect that the skin is becoming infected, seek the advice of your doctor.